It’s been six months since I posted about the value of the VMware Certified Professional (VCP) certificate, and I thought I’d provide an update. As the image shows, courtesy of indeed.com, the VCP is as hot as ever. 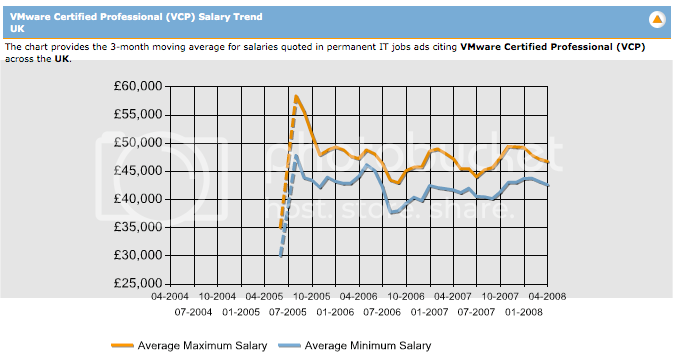 The big gain in VCP salaries over a period of less than six months shows that this technology is still very much an in-demand skill set and a hot certification to show off. It’s a new year and salaries did jump overall, so this is reflected in the data. As before, the international trend is also continuing, as the next two images (from itjobswatch.co.uk) show, in terms of salary and demand. I intend to keep tracking these statistics every few quarters, so stay tuned. I’m also keeping my eye out for Citrix-sponsored Xen certifications and will be bringing an analysis of those to the blogosphere as soon as there’s some quantifiable information available. And with VMware ramping up its certification programs, I expect to be adding second and third-tier VMware certifications. What other certifications do you think should be compared? I’ve included a broad list of non-developer certs to show the variety and range in entry-level (MCP, A+) system admin certs through top-tier (CCEA, RHCA) certs to compare the VCP’s placement as a hot-technology. I’ve left off network, storage and many specialty certs because they may not be pervasive enough in the enterprise or may not be relevent topically. Since I’m one person with one view, I hope our readers will comment below and dictate to me what should be compared. So please fire away. I can recall when the same analysis started to be reported about the "value" of the MCSE certification. What is missing from any of these charts is the average income of the same person before and after they achieve the certification. Any gain in average income could easily be accounted for by highly experienced (and paid) industry veterans gaining the cert. Hi Larry - That's a good observation (and I think it explains the large initial spike in the British chart from 2005/2006). What I think counters that somewhat is that across the charts, all of the certifications are treated equally with regards to experience levels and existing salary. Somebody with lots of experience going into the CCEA level program, or the RHCA program, is going to have the same impact on the overall numbers as somebody going to get their VPC. 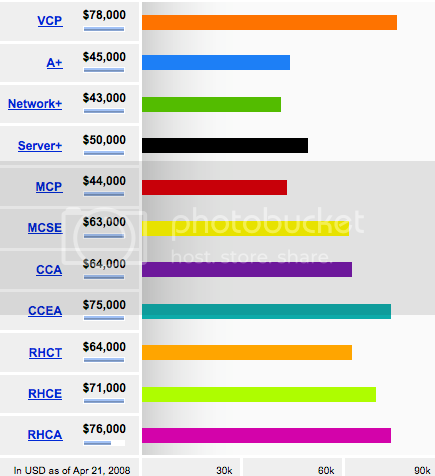 Most of the industry certifications do not require a $1k class to get certified like VCP does. I am all for keeping current with technology and certification but a self study path to certifications should be an option. Thanks for the statistics... It is a well known fact in the IT job industry that updating your knowledge through a plethora of IT certifications helps you in commanding a higher salary from your employer. VCP certification is recently gaining huge popularity and is professionally known as VMware Certified Professional. Though it is a fact that for taking the VMware authorized training course, you need to pay a lot of amount besides maintaining and fulfilling the strict requirements of the course and it has a huge demand in the market. So… obviously they demand more package. The Network Controller, also known as a network control operator or network control technician, is a tech specialist who monitors the overall engineering infrastructure of an organization. They continuously plan, design, and evaluate to ensure network performance is not compromised. The main job of a network control operator is to maintain the network through keeping a close eye on the performance of the network as well as manages issues through routine troubleshooting. If the problems lie within a complex network, they do advanced troubleshooting. They work closely with an engineering team to provide network architecture design and recommend new technologies to enhance current performance. As a leader in the virtualization space, VMware certifications are a must-have for many IT professionals, especially those who work in data centers and/or support virtual environments. Many organizations are now turning to cloud to steamline processes, minimize costs, save space, and improve efficiency, etc., resulting in a demand for IT pros who have serious virtualization skills. Management of all these aspects require immense skills. There are many organizations in the present which are offering high-end short-term courses to train professionals with the skills of managing the data center virtualization. These courses helps the individuals become expert in the field and manage data center needs proficiently.